Folded color map in Spanish with legends and brief history also in English. 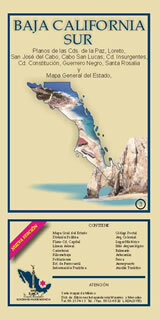 Contains postal code information and tourist sign guide. Includes state map (scale 1:825,000), La Paz (1:19,200), San Jose del Cabo (1:25,700), Cabo San Lucas (1:25,800), and Loreto (1:13,500).